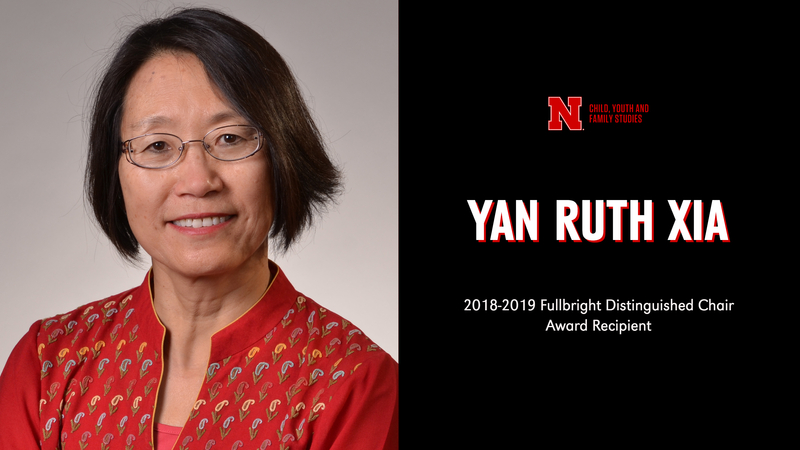 Yan Ruth Xia, Professor in the Department of Child, Youth and Family Studies (CYAF), has received a 2018-2019 Fulbright Distinguished Chair Award. The award provides a grant that will allow Xia to do both research and teaching in China during the fall and spring semesters of 2018-2019. According to the Fulbright Scholar Program, “Fulbright Distinguished Chair Awards are viewed as among the most prestigious appointments in the Fulbright Scholar Program.” In order to be considered for a Fulbright Distinguished Chair Award, a candidate must have an extensive publication and teaching record. Xia is the first professor at the University of Nebraska–Lincoln to receive this award. In the past 20 years the university has had 49 faculty with U.S. Scholar grants across all colleges and disciplines. Since 2010, many university faculty have hosted visiting scholars from all over the world. The Fulbright program equips the university and its faculty to have a larger global reach, which in turn translates to globally competent students. Through the proposed project, Xia will introduce family studies to Chinese students and scholars. Her research, in collaboration with faculty at East China Normal University, will examine the associations between parenting style, socialization and adolescent emotional wellbeing, using a mixed methods approach. Data will be collected and analyzed from both Chinese parents and adolescents. She will also teach a research and evaluation seminar and give lectures on various issues in contemporary family studies. Even though Xia doesn’t leave until August, she has already participated in a rigorous three-day orientation in Washington D.C. and will attend another at the U.S. Embassy in Beijing in August, prior to arriving at East China Normal University. Thus far, Xia has discovered that there are many ways for faculty to be involved as a Fulbright Scholar. “I was surprised at how intense the peer review process was, and I was also surprised to discover the many awards Fulbright offers,” Xia said. Faculty interested in applying for a Fulbright award should contact Elizabeth Lange, whose role as the university’s Fulbright scholar liaison is to help promote awareness of and participation in Fulbright programs among faculty. Lange is available to provide a diverse range of services to interested faculty and can also help them get in touch with strategic resources in pursuit of any Fulbright award.